Handmade by Helen J: Homework! This week I've been taking part in an online Watercolour for Cardmakers class, having a lot of fun trying out loads of new techniques. An added bonus is that it's made me dig out some supplies I've had for years but never really used. When I saw this week's challenge over at Less is More - one layer "thanks" - I decided to combine a couple of the techniques from the class to create a card for the challenge. The challenge over at Keep It Simple is watercolour so I've decided to play along there, too. The word is part of the Pretty Words Set by Miss Kate Cuttables, which I "wrote" using a Derwent Outliner Pencil with my Sizzix Eclips. The finished result is a little more vibrant than my usual style, and very probably not CAS enough for Less is More, but I really quite like it. Helen, I love how your card turned out. The thank you came out nice. I want to try the masking fluid. Good Job. gorgeous card, love the watercolor feel. 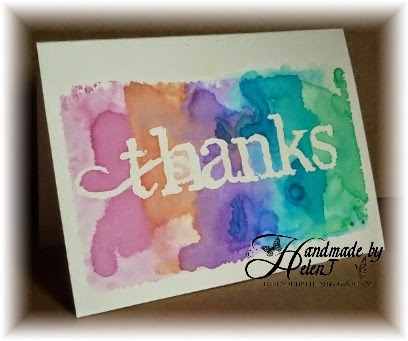 Lovely card - super effect with the watercolouring. 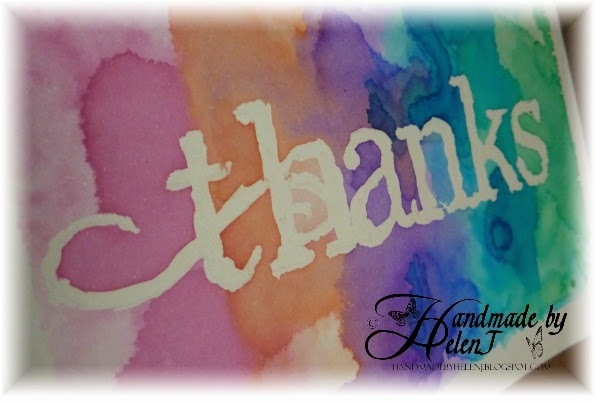 Loving the watercolours appearing in blogland and your card is beautiful, gorgeous bright colours and fun sentiment style. Love this card, the colours are so beautiful together. Wonderful card, Helen! great effect and gorgeous colours! I LOVE this effect Helen! Fabulous card, Helen, love the watercolour technique you used, the colours are very pretty. Loving your watercolour technique on this card Helen.